The employee review process should address concerns and feedback and offer both short and long-term goals. The review process can help to determine salary adjustments, track whether or not progress was made, and address problems. 96% of employees report that receiving specific, continuous performance feedback is helpful. Whether you’re a manager or one of your organization’s sterling HR representatives, you’re probably more anxious about the annual employee performance review process than your employees are. In fact, managers spend 210 hours a year on performance review process best practices. Regardless of how you and your employees feel about performance appraisal practices, reviews and employee performance tracking still needs to happen. How else is upper management going to determine salary adjustments, track whether or not progress was made, and address problems? What many managers sometimes fail to realize is that the employee review process doesn’t have to be the stereotypical typified, stale, and potentially awkward (or difficult) conversation that it has typically been. We’ve created an actionable list to guide of best practices so that both you and your direct reports can maximize the time spent on reviews and better manage and motivate your talent. 1. 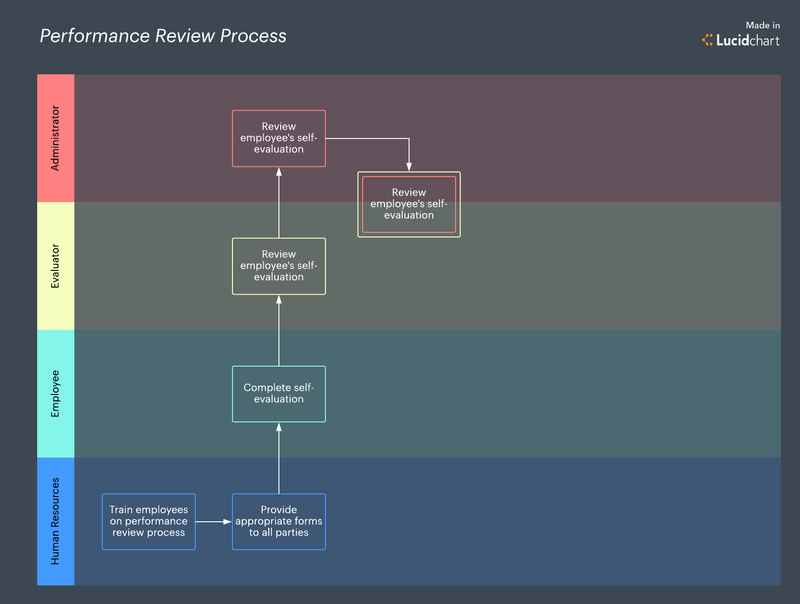 Determine which type of performance review process your company should use. Management should create a safe space for direct reports to have conversations with managers—as opposed to an authority-driven space where a manager just tells each employee where they’re failing and why. Businesses should get into the habit of coaching their direct reports instead of disciplining them. Let’s look at the different review processes you can do to achieve this. Top-down: Supervisor meets supervisee to discuss mistakes and insights and provide constructive feedback. Self-evaluation: Employees judge his/her performance both with qualitative and quantitative measurements. 360-degree: Incorporate feedback from peers, direct reports, and non-direct supervisors. Ratings: Use a scale or grading system, usually customized for a particular organization. Mix and match: Combine any of the above. If you’re currently redesigning your employee review process see how utilizing our swim lane diagram software can streamline your efforts! 2. Set and maintain communications standards. Another aspect that a successful manager should look at if they’re wondering how to do an employee performance review is their current communication style and methods. It may surprise you to hear that 76% of all employees want feedback at least monthly. With that fact in mind, get in the practice of holding weekly or bi-monthly one-on-ones with each of your direct reports. By having regular contact and communication, you can ensure that expectations are being met and that you are maintaining a regular review process consistent with your culture. Additionally, this will give you the chance to coach your employees along the way instead of having potentially painful conversations at the end of each quarter. In fact, some employers create weekly templates for their one-on-ones where employees discuss what’s working well, what’s not, and what their short and long-term goals are. Each of these methods will help ensure performance review process best practices. Hosting these regular, informal meetings will help build the conversation so that when the time comes for your formal review process, there will be no surprises in regards to employee appraisal. In fact, start to visualize a timeline for when reviews will be completed with Lucidchart’s timeline maker. 3. Get organized and prep for the meeting. While not everyone may agree about regular meeting cadences and how the meetings should be conducted, research speaks for itself: 92% of employees agree that if constructive feedback were delivered to them appropriately, it would help motivate them to improve their performance. And it’s not just about correcting “negative” behaviors: Nearly seventy percent of employees report they would work harder if they felt that their efforts were recognized. By preparing a template that your employees can fill out before each meeting, you’ll be able to go into each meeting with very clear expectations. Employees want to be treated like adults. Don’t keep them in the dark so that issues snowball and the conversation becomes awkward and painful. Coach instead of acting like a disappointed parent. Perhaps the most important tip regarding how to do an employee review is to be honest and keep the regular informal meetings short (20-30 mins). By staying organized, you can maintain control of the conversation while letting your employees do all the talking. 4. Actualize goals & improvement areas with a measurable SMART formula. As it turns out, only 6% of workers believe that their organization’s employee review process is one that is worthwhile. In response to this startling number, five of the biggest companies in the global market decided to get rid of their traditional performance reviews and, instead, focused on creating more frequent check-ins and offering real-time feedback to their employees. The best strategy to improve your workforce is by listening to your workforce. By incorporating employee concerns and feedback and offering both short and long-term goals, companies are able to successfully redesign their performance management. Utilizing the SMART acronym allows both managers and direct reports to create and achieve goals while monitoring progress. The SMART criteria is used across many modern disciplines, and the employee review process should absolutely incorporate this proven design. By utilizing more frequent, consistent touch points; redesigning and implementing effective performance appraisal practices; and organizing meetings with better tracking procedures and goal-setting, you will see a vast improvement in your overall review process and employee satisfaction. It’s no wonder that the majority of all international organizations are reinventing their current employee review processes. But more inspiring is the fact that it actually works: 96% of employees across multiple dozens of organizations report that receiving specific, continuous performance feedback is helpful. What does your employee review process look like? Many organizations have different theories about which ones work best. If you don’t have a preferred process, consider using our org chart software to both create and streamline performance review process best practices.